Wouldn’t it be great if you could climb into bed, snuggle under your covers, and fall asleep without any fuss or fear? Without listening for noises or thinking about bad guys? Without an extra drink, or an extra hug, or an extra trip to the bathroom? Bedtime is tough for many kids. If you’re a kid who dreads your bed, and are convinced that nothing short of magic will make nighttime easier, this book is for you. 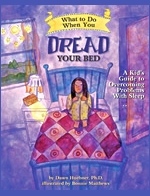 What to Do When You You Dread Your Bed guides children and their parents through the cognitive-behavioral techniques used to treat problems with sleep. Fears, busy brains, restless bodies, and overdependence on parents are all tackled as children gain the skills they need for more peaceful nights. This interactive self-help book is the complete resource for educating, motivating, and empowering children to fall asleep and stay asleep – like magic! 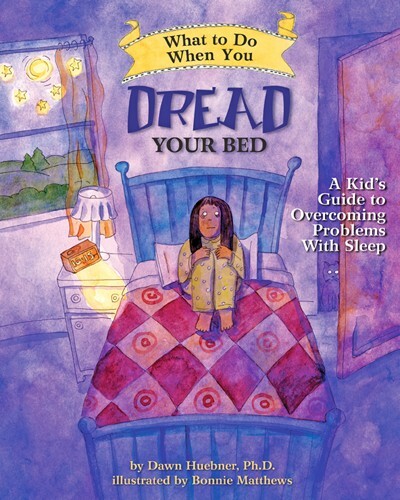 Dr. Huebner has written a fun, invaluable book for parents and their children who dread going to bed. Her use of magic tricks and games to help children overcome their bedtime fears is engaging and unique. A ‘must have’ guide for parents and children who want to create healthier sleep habits. What to Do When You Dread Your Bed is a lifesaver for parents and children struggling with bedtime anxiety. Full of practical solutions for a range of sleep problems, as well as creative (and fun!) problem-solving suggestions, this guide will turn bedtime tears and fears into sweet dreams and peaceful, restful nights.